'Bijoy Dibosh' (Victory Day), a national holiday that every country has, a day when countries try to commemorate the victory that they gained through important wars in history. Our country is no exception. We take out the national flag stored inside our cupboard, blow the dust off, and let it fly high up in the sky. We go to the Smriti Shoudho, listen and watch the radio and TV channels airing special programmes, seminars and talk shows are held, social media gets swarmed with national flags, quotes on the spirit of patriotism and victory are shared to a greater extent on this very day. We find cheerful and happy faces with red-green attires that throng the streets. Yes, we do live in a sovereign state today. We have the 'victory' to 'celebrate'. 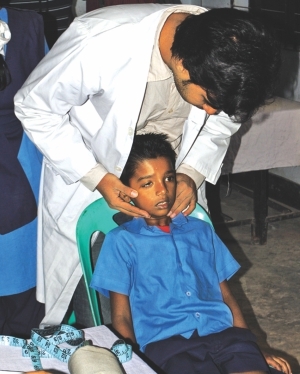 Free medical check-ups arranged at Agargaon where the young volunteered. So, is the fight over? Have we actually embarked on a victory lap? Liberation War is over, but, the dictatorship of poverty, illiteracy and corruption still prevails. Beset with hundreds of thousands of social problems, what can be more heart wrenching to see than the terrors on the streets created by some groups of youth called the 'Chhatra Shibir' and 'Chhatra league' today? So how to celebrate the victory by doing something more than just words, songs and decoration? How to enhance the spirit of patriotism among the youth through celebrating the victory? The thought stroke the minds of some young leaders three years back, namely, Sabhanaz Rashid Diya, the Founder to One Degree Initiative Foundation and Nablia Idris, Founder of Community Action. They were inspired by the words of a senior friend who lives abroad but has always been a promoter and support to their activities. Thus, 'Celebrating Victory through Volunteerism (CVTV)' was initiated. CVTV is a platform for young people to celebrate victory through an act of charity. The three convening organisations of this programme are, namely, One Degree Initiative Foundation (1di), CommunityAction (CA) and Bangladesh Youth Environment Initiative (BYEI). 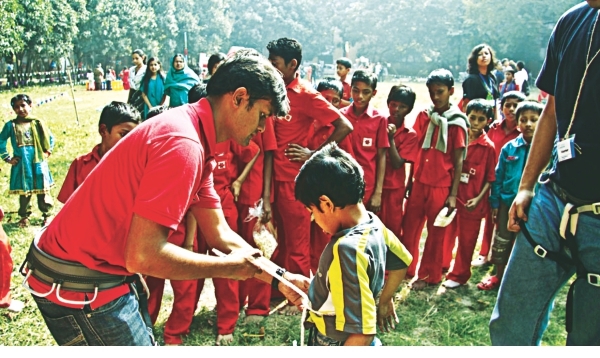 Musa Ibrahim at an adventure camp arranged for underprivileged children. Tonmoy Chokroborty, one of the Coordinators for CVTV 2012, says, “What the freedom fighters did was actually volunteerism at its finest, most purest. They sacrificed their family, their career and most importantly, their lives to bring us freedom. Now we no longer have to fight with rifles against some human enemy. But we have to continue fighting against poverty, against corruption to reach the Millennium Development Goals. That's why we need everyone to volunteer from whatever position or capacity they hold.” Tonmoy studies Electrical Engineering at National University of Singapore. 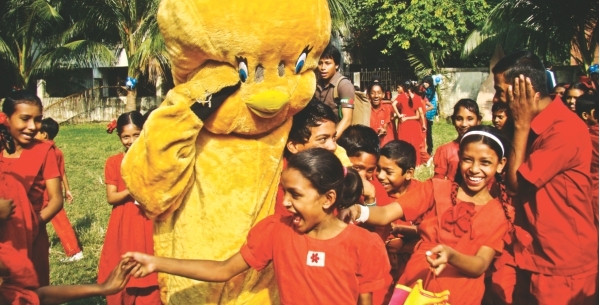 Bringing smiles to the faces of underprivileged kids on the eve of victory. The list of participating organisations and activities in CVTV last year, shows how a diverse group of organisations have come under the common platform of community service. 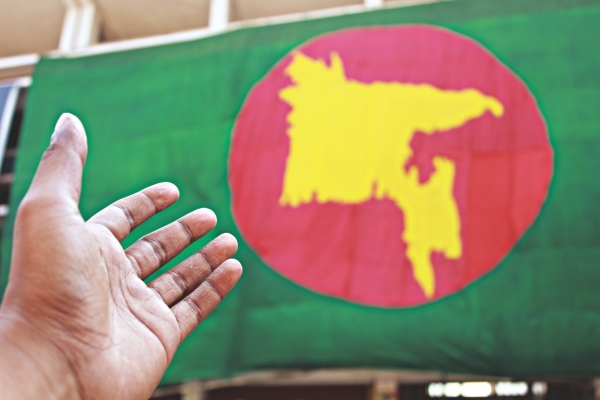 “Small acts of charity from organisations all over Bangladesh will give rise to a new liberation movement. It will give us victory over the many difficulties we face today. That is a purpose of CVTV that no matter which position you hold in the social hierarchy, you can continue serving your nation to your capacity. Community Service is not always about a grand gesture, it's about being compassionate about your neighbour,” says, Kazi Najeeb Hasan, another Coordinator of CVTV 2012 and a student of Architecture at BRAC University. 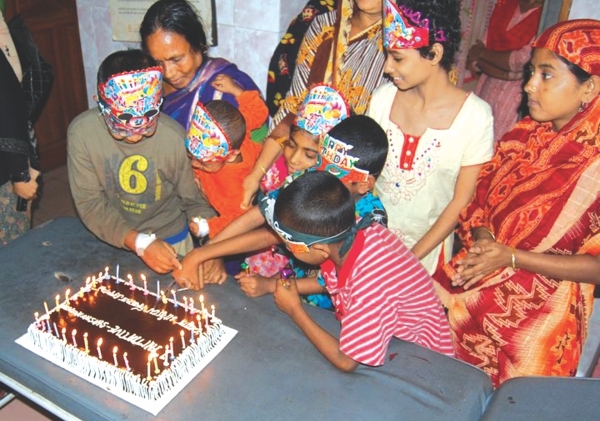 Celebrating victory with cancer affected children. The promotion of CVTV is mainly done through social media and word of mouth. 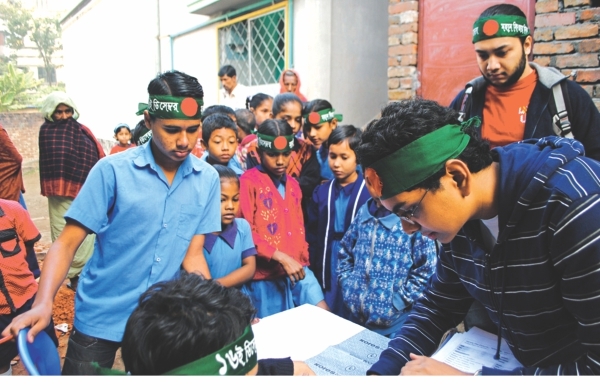 Last year, a total of 74 organisations, including youth organisations, schools, colleges, universities, hospitals, multinational corporations, community service clubs from all over Bangladesh and abroad, participated through various kinds of activities—distribution of warm clothes to the underprivileged, tree plantation, setting up libraries, street theatre, blood donation campaign, photo exhibition portraying positive image of Bangladesh are to name a few (visit the official page of CVTV on Facebook). At the end of December, a press conference is held to publish the activities done throughout the month. Bir Protik Lieutenant Colonel Q Sajjad A Zahir (Retd) has been the chief guest for the closing ceremonies of CVTV 2010 and 2011. The activities need not be confined only in the month of December, but it can go round the year. You can just take the pledge and start working under the banner of CVTV from December. “Volunteerism gives every citizen the scope and opportunity to exercise their wills to bring positive changes in the society that they would like to see. Being involved with volunteerism one can feel about a problem, own the problem and then, put one's effort to address it,” says Shehab Shamir, President of BYEI, a convener organisation of CVTV. Sanjoy adds, “I have been associated with CA since December 2010. It was CVTV that caught my attention in the first place. I remember since I was a child, 16th December has always meant something special for me. Growing up with hearing stories from my father about the war and about the bravery of the Freedom fighters, I always felt that I owed them my gratitude. CVTV gave me the best way of expressing my gratefulness to them.” Sanjoy is a student of Electrical and Electronic Engineering at American International University Bangldesh (AIUB). Yes, with the 'oborodh,' traffic, load shedding, price-hikes and session jams, it is very easy to get frustrated and exhausted. Then you start bashing up the political parties, the 'bangalis' and the overall country (most of the time through your facebook status) and take an oath to leave the country the moment you get a chance. But, before doing that, take a deep breathe and look around. Is there anything that you think you would like to do from your part? Like, giving your old text books to the children living in the slum beside your house? Or may be, you can call up on your house-help and groom her on health issues and hazards of early marriage? How about visiting an old home with some of your friends and painting a room for them? If you are able to do these activities, if you are able to bring a smile on a face, then be sure that, there is still hope and you are the beholder of that hope. Happy Victory Day!